The solution is simple. Log off from the administrator account and use the one that was setup for the migration – this seems to do the trick. The only thing left (for me) is to work out how to modify the report to send me the last 24 hours of backups – not just the last and the next backup job. We backup 3 times a day but only find out the status of the last job with the existing reports. Apparently, according to Microsoft KB Article 2009365 this issue occurs when a previously hard drive (or the only previously defined) hard drive has been removed from the server and a new drive is being attached. This is typically the case when setting up a new server and preconfiguring the backups to go to the second identical usb drive. Most people are just going to unplug the drive leaving the old power supply and usb cable attached to the server and power and plug in the new drive and then attempt to add it to the backup schedule. At this point the backup program will give the error “The filename, directory name, or volume label syntax is incorrect” as the old drive is no longer attached. Microsoft have a couple of solutions, including adding the first drive back to the server, or removing the first drive. Neither of which are very helpful if you are just swapping the external drive itself. The final solution is to add the drives from an elevated command line using the following. 5. You may be prompted to format the drive if it was previously used in another server or for another purpose. The screenshot below shows the addition of a USB drive to my virtualised SBS server. Apparently, running the initial SBS pre migration assistant starts the 21 day timer even if you don’t continue with the rest of the installation. 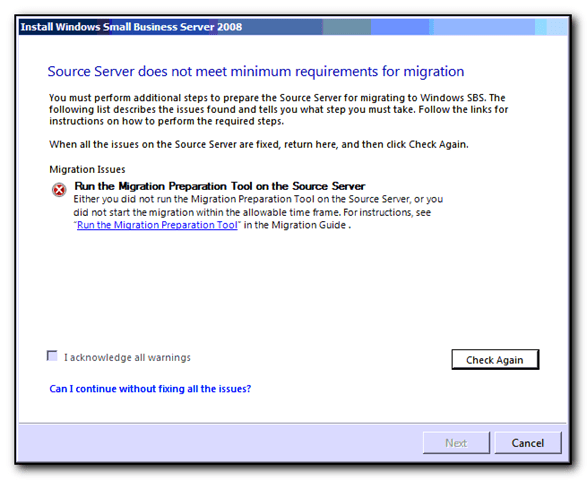 Attempting to install SBS after 21 days will provide an error message stating “Source Server does not meet minimum requirements for migration” as per the screenshot below. notepad "C:\Program Files\Windows Small Business Server\Logs\SBSSetup.log"
Towards the end of the log file will be the reason the migration stopped. In this case it was to do with the HKLM\ Software\ Microsoft\ SmallBusinessServer\ Migration\ MigrationReady containing an old date and LastCheckTime (value of 1) being set to a long time ago. I’m not sure whether hacking these values out would allow you to continue on with the install but I’m going to rerun the migration wizard again. Unfortunately this requires another (pointless) reboot of the source server – something I am trying to avoid when setting this up in a parallel installation. Quickly download the SBS 2011 training from Microsoft. List of SBS 2011 Training videos file, you can use wget to download all of the files in a batch file. Assuming you have wget installed on your machine and it is in the path (if not then why not? It is incredibly useful for downloading files from a command line – Get it from Sourceforge’s wget page), just run with the following in a command prompt window. You should end up with 38 files totalling 241MB. I finally got around to taking 70-653 on Friday and passing it. It was an interesting experience as I had to take a survey before the exam that asked questions about my experience with the product and what I thought were my strengths and weaknesses. If I didn’t know the exams were downloaded overnight, it would make me very suspicious – if I answered that I didn’t know remote access very well, would I get lots of questions on vpn configuration or would Microsoft be kind and avoid that area? Although I passed it would have been nice to also get a comparison with my answers from the survey and my final test results. Funnily enough my weakest area was user management – I’m pretty sure that is because I’m so used to doing things in AD and I know to do things with the wizard but I don’t pay attention to EXACTLY what the wizard is called. This turned out to be occurring when the Rollup 9 package was being uninstalled. Checking into the registry and hklm \software \ microsoft \ windows \ CurrentVersion \ Installer \ UserData \ S-1-5-18 \ Components \ numbers \ numbers. Taking ownership of the parent registry key and then assigning my admin user full rights to the parent and cascading permissions would allow the procedure to continue a little bit further. Eventually after a couple of attempts I expanded the Components key in regedit using ctrl + and then used the arrow key to move all the way through, fixing permissions as required. The lazy way would have been to set permissions at the Components Key but that may cause other problems I didn’t really want to deal with in the future. I have no idea why the permissions were so screwed up but I really do not appreciate wasting 4 hours on a Saturday afternoon trying to fix the issue – it took a while to debug the initial errors and then more time to run the install, find out it kept causing errors with different registry locations and then navigate through the entire component tree. The Zero downtime migration strategies for Microsoft Networks book by Karl and Manuel Palachuk has arrived in the post this morning. An expensive book but I’m hoping this will reduce the number of weekends I have to work. Even if the book saves me 5-6 hours once, it will be well worth it. 590 pages to read, full of checklists and stuff – I’m looking forward to going through this. Unfortunately it came 5 days late for last weekends migration. I’ll be writing a review later when I get a chance to start reading on it.